On Second Scoop: Ice Cream Reviews: New Feature: College Mondays! (wait, it's Tuesday!) "Famous" Aggie Ice Cream is up first! "Famous" Aggie Ice Cream is up first! Ok, everybody, time for another guest blogger! Big thanks to Adam for writing the upcoming series of posts and also big thanks to Aggie Ice Cream for hooking him up with 6 free pints of ice cream to review! Adam Nettina is the cowriter of GrubGrade.com and a senior history major at Utah State University. While he's not savoring famous Aggie Ice Cream or making paninis, he serves as sports editor for the campus newspaper, the Utah Statesman. When you think of great ice cream in the United States, the state of Utah probably isn't the first place to come to your mind. Shakes? Pastrami Burgers? Fry Sauce? Sure, we do those quite fine, but tucked into cozy Cache Valley (not far from the Idaho border) is one of America's best kept Ice Cream secrets: The Utah State University creamery, and the deliciously indulgent treat known simply as "Aggie Ice Cream." Make that "Famous Aggie Ice Cream," as they say up here. As a senior at Utah State University, I've developed a love of this delicious product over my academic career at the Logan, Utah university, and have encountered no other ice cream (or frozen dessert, for that matter) to match it. It wasn't always this way, however. In the interest of full disclosure, I come from a long line of suburban "light ice cream" eaters, and grew up mostly eating reduced fat and fat free ice creams that were staples of my family's weekly shopping list. And while I still enjoy a good bowl of Edy's Slow Churned or Breyer's Smooth and Creamy line, my introduction to the world of fresh made, 12% butterfat ice cream from the Utah State creamery has been something of a tasting nirvana. Like most colleges with their own dairies, Utah State has a reputation as a premier agriculture university. The ice cream first got its start back in 1922, but really took off in the 1960s, when the dairy fused with the College of Family Life to pioneer a food and nutrition program here at the university. Today, ice cream is made in a modern facility on campus, and is available bot only n a retail store operated by Utah State, but also in the college's main dining hall and in Utah based grocery stores throughout northern Utah. But enough of the history lesson, lets get to some tasting! Aggie Ice Cream comes in 26 flavors, although seasonal flavors sometimes pop on and off the menu. 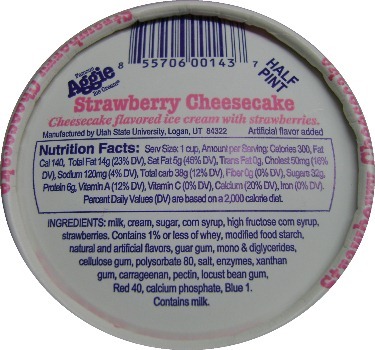 While all flavors are available at the retail store on campus, six base flavors are sold in 1/2 pint containers. Depending on where you buy them, they usually retail around $1.50. Over the next few weeks, I'll be sharing my thoughts on each of these flavors, starting today with Strawberry Cheesecake and Chocolate Chip Cookie Dough. I'm not going to lie – I start with these two flavors because they're two of my favorites. When I get ice cream in our on-campus dining hall it comes out via a large bucket and is incredibly creamy. However, if you buy the 1/2 pint you'll have to let it thaw a little. It's a densely filled container that's hard packed, and it's apparent from the texture that very little air has been pumped into the mix. After giving both flavors some 5 minutes or so on my counter, I notice that the hard nature of the ice cream begins to breakdown, and my spoon slides nicely into the creamy base. Ok, first up is Strawberry Cheesecake. The name is a little bit of a misnomer, because there are no actual "cheesecake" pieces in mix, but rather a cheesecake flavor. 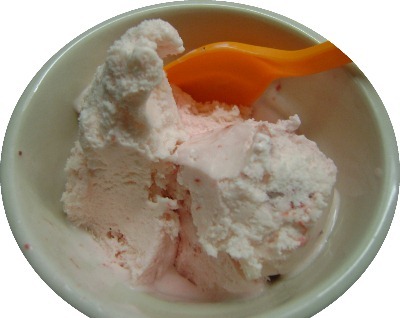 Nevertheless, it's still very strong and sweet, and compliments the frozen pieces of strawberries in the ice cream. I'm impressed by the cleanness of the flavor and the richness of the ice cream, which has a pleasant mouth feel that lingers on the palate. Being a child of the 1990s, I'm usual an additive fiend, but I've grown to love the simplicity of the ingredients used, and thanks to Aggie ice cream I have begun to notice the superiority of ice cream that starts with the familiar milk, cream, and sugar ingredients. That's what I love most about this flavor - it's simple strawberry ice cream as it should be; fresh tasting, creamy and sweet. There's no ice crystals forming around the strawberry pieces and no overly sweet strawberry-type glaze, just real, honest to goodness ice cream. Cookie Dough is next, and I've been waiting for digging into my personal my half pint all week. Because they rotate flavors in our dining halls, I can't always get my hands on my favorite flavor, so I always wait to indulge until they have it. But today I've got my own half pint, and I'm going to savor it. 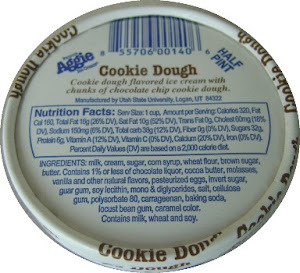 Unlike most major brands, Aggie ice cream's cookie dough doesn't utilize "fake" cookie pieces - that is to say, the kinds of pieces that have been so jacked up with partially hydrogenated oils that they taste overly oily. The pieces in my half-pint aren't huge, but they're nice and chewy and have a strong molasses and butter flavor. There's even an element of nougat taste in them that really comes out with a great hint of salt, and most impressively, the flavor has transferred over to the vanilla ice cream base. The chocolate chips are small and semisweet, but they provide a nice and not to overpowering compliment to the cookie dough flavor, which is the star here. 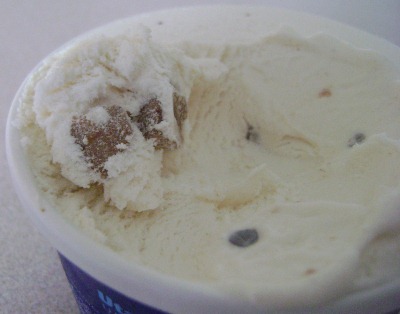 What I love most about this ice cream is that it isn't just vanilla ice cream with cookie dough pieces, but a chocolate chip flavored ice cream (and think your grandma's best chocolate chip cookie) with chocolate chip cookies in it. Once more, it's incredibly creamy and fresh. You can order Aggie Ice Cream from their website, and of course, you can stop by the dairy on campus and pick up an over-sized cone of your own. And while you're at it, why not check out the Western Athletic Conference's best basketball team, and enjoy the many outdoor activities that Logan has to offer! Up next week: Caramel Cashew and Cookie Fudge. I'm very jealous of the 1/2 pint serving size. Much better size than most single serves, and it sounds like the ice cream is a winner.